MTN Zone Deal package is available for only MTN pulse subscribers, as it was used to give subscribers cheaper data bundles before they introduced their new and subsidized plans. MTN Pulse offers more than 750MB for N500 and other normal MTN data plans like the N1,000 gives you 1.5GB of data more than the Deal Zone used to offer and so much more. MTN Pulse N500 for 1GB is still classified as MTN Deal Zone package, because the normal data volume for N500 internet data subscription on MTN is 750mb [500MB + 250MB (*bonus data)] . 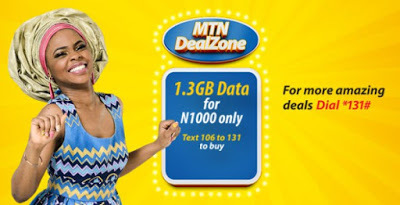 If you’re interested in getting the Deal Zone package of N500 for 1GB data plan. All you have to do is to migrate to MTN pulse by dialing *406# and follow the screen prompts. NOTE:If you do not receive any of the two messages above, that means you’re currently not eligible for the MTN Deal Zone package. You’ll have to watch out for other MTN data plan package.